Also known as the horseman’s hammer since it was often wielded by a knight on horseback, the war hammer was first documented in the late 14th century as a response to the ever-increasing use of plate armor. Painting by Paolo Uccello, 1438. Image made available by the Yorck Project. Roughly 2 feet (61 cm) in length, the typical war hammer resembles a carpenter’s hammer with a blunt head at one end, and a solid spike instead of a claw on the other. Models from the 1400s began to feature another spike added to the top, creating a tri-pronged weapon. The haft, constructed of wood and iron, or full iron or steel, provided the strength necessary to inflict serious damage. Similar to a mace, the blunt end could stun an opponent, dent plate (or shatter poorly-forged plate) or fracture bones beneath any type of armor. The added benefit? The broad-based spikes delivered blows that penetrated and pierced armor. The top spike provided the coup de grace, allowing for a quick, two-fisted end. The medieval flail – does any other weapon conjure up gruesome battle the way it does? Who can forget that scene in Return of the King when the Witch King swings his heavy flanged-headed flail and smashes Eowyn’s shield to bits? He chose wisely in picking a weapon of intimidation – flails just look nasty. The flail was a wooden handle with a spiked ball or balls attached on the end by either a flange or chain. A single-balled flail was known as a morning star, and while other models featured more balls, they were all rare weapons, only appearing in art in the very late 15th century. Hence, they were likely never used in medieval battles. The more common type of flail came from the peasantry, namely from harvesters of grain. Used for threshing, the long wooden stick had a flange at the tip which connected to a smaller wooden club. The peasants would beat the grain on the threshing floor to separate the useable wheat from the chaff. When it came time to fight, the peasants would grab whatever weapons they had; hence the flail developed its second purpose. Often, spikes were added to the club end. The ball-and-chain flails proved just as dangerous to the wielder as to the enemy; due to the chain that could go slack, these weapons were unwieldy (as anyone who’s ever messed with nunchucks can attest). The pole versions were not much better in the hands of a novice, but the peasants who used them day in and day out brought their experience to wielding them as a weapon, and proved formidable indeed. Basically a club with a decorated head, a mace served as a cheap weapon that was simple to make. Maces date back to ancient times when the heads were made of stone, which easily broke. In the Middle Ages, maces were comprised of copper or bronze heads atop wooden shafts. The shape of the head could be starred or flanged, the point, literally, being to concentrate the blow into a small area. With the short points and wide base, the heads withstood the blows without breaking. Used as early as the 11th century, maces rose in popularity as more plate armor was worn, but they proved effective against all types of armor. The crushing blows inflicted by a mace could break bones even through chain mail. Against plate armor it was less effective, serving to dent, damage, and deform or better yet, to penetrate the joints, all in hope of immobilizing the enemy. Often used by clergy in the desire to avoid the shedding of blood, the mace evolved into an all-metal weapon. Perhaps due to the position of the clergy who wielded them, maces became a symbol of authority. Favored by kings, maces were constructed less as weapons and more as showpieces for royal ceremonies. No doubt, being a knight was a serious business. In populated towns, knights were the only ones authorized by the king to carry weapons. Hence, they were the law enforcement officers of the Middle Ages. Certainly it was an honor to serve their sovereign lord on earth, but their responsibility stretched beyond, to serving their heavenly Father as well. The knighting began with a cleansing bath, followed by all-night prayers, and the ceremony taking place in a church the next morning. Men who proved themselves in battle could be knighted on the field or on “the fly” due to war, but such occasions were rare. In any case, the knight-to-be swore fealty to his lord and to God before witnesses. A knight’s duties included defending the weak, orphaned, widowed, and oppressed, giving special care and good counsel to women, defending his fellow knights and never running from a fight. During knighting, his sword and shield as well as his person were prayed over, so that God would grant him the strength to hold to his oath, and wield his weapons appropriately. His sword was then girded to his waist. Thus, knights were viewed as God’s judicial arm on earth. If any of their vows were broken, it was an affront not only to a knight’s sovereign lord but more importantly to God; broken oaths held divine retribution and eternal consequences. The hilt of the Christian knight’s sword, with its straight cross guard perpendicular to the blade, created a cross that he wielded and carried on his person at all times. It was a constant reminder of the duties he had sworn to fulfill. Pommel decorated with the arms of Pierre de Dreux, Duke of Brittany, 13th C.
The hilt is comprised of the grip, the cross guard, and the pommel. The grip for the hand measured 6 to 8 inches (approx. 15 to 20 cm) long in proportion to the length of the blade; the longer the blade, the longer the grip (and hence more room for a second hand to wield the sword). Hidden beneath the grip was a pointed extension of the blade known as the tang. The cross guard, affixed perpendicular to the blade at the head of the tang, created a foil to protect the hand(s). Swords made during the 10th to 13th centuries were designed for slashing and cutting and thus proved “blade heavy” compared to the length of the hilt. The trick was to counter balance the blade without diminishing its striking force. Hence, the pommel was added at the end of the grip as a counter weight. Pommels came in assorted shapes such as disk, wheel, triangular, fish-tail, and plummet, as well as those looking like a mushroom, tea-cozy, or brazil nut. Nobles sometimes added a jewel into the pommel or had it engraved with their coat of arms. Any part of a sword could be used as a weapon, and many a knight found himself in a situation that forced him to get creative. The pommel, grip, or cross guard could be employed to great effect. It should also be noted that in medieval times there was no such thing as fighting “dirty”; any and all maneuvers were on the table. The idea was to defend oneself while spotting and exploiting vulnerability at a moment’s notice. Since much combat in the Middle Ages took place at close quarters, swords were the weapons of choice. In earlier times as well as through the age of Christianity in Europe, swords were expensive and valued by their owners, passed down through families, engraved, and often given names, as told in many a legendary tale. Swords were made of the best iron or steel available. The blades had to be strong but flexible to withstand hitting solid objects such as armor, shields, and other swords. Early medieval swords had twisted iron rods at their core which gave the blades flexibility, but iron proved too soft to hold a sharp edge; steel strips were welded on for this reason. The blade shape of these early swords was long and straight for the purpose of cutting. Chain mail was invented to counter the slashing force, but blows from these weapons could still break bones beneath. As steel became more available in the later Middle Ages, swords were made of it entirely. The blade shape changed to counteract chain mail, turning more pointed to both cut and thrust. Early swords up through the mid-14th century had another feature, the fuller, which is a shallow groove that ran almost the full length of the blade. People often call this the “blood groove” but that is a misnomer and a myth. The fuller’s purpose was to make the blade lighter and more flexible without compromising strength. A cross-section of the blade resembles a holly leaf. As blades became more tapered to a finer point to counteract plate armor, the fuller filled in; a cross-section of these blades from the later 14th through 15th centuries resembles a diamond. Don’t believe the myth that swords weighed 20 to 30 pounds; that just makes me laugh out loud! Light and fast blades were the point, literally. More on the pommel and hand guard next time. Crossbows could shoot bolts just as far as longbows, but were impossible to reload as quickly. The concentration necessary, as well as the odd position the wielder had to bend into in order to draw back the bowstring (foot in the stirrup at the end, engaging a lever or crank, or using a claw strapped to the waist) left the crossbowmen open to attack. Hence the pavise, a large curved shield placed on the ground and able to stand on its own via props, provided a barrier that the crossbowmen could hide behind while reloading. These shields ranged in size from 16 to 20 inches (42 to 45 cm) wide, and 22 to 42 inches (57 to 107 cm) high. The larger size weighed roughly 17 pounds (7569 g). Pavises were first employed by the Genoese crossbowmen, the highly experienced professional soldiers from Genoa, Italy. Knights despised crossbows, as the bolts could pierce even the finest armor. So deadly were crossbows in fact, the Pope outlawed them at one time. 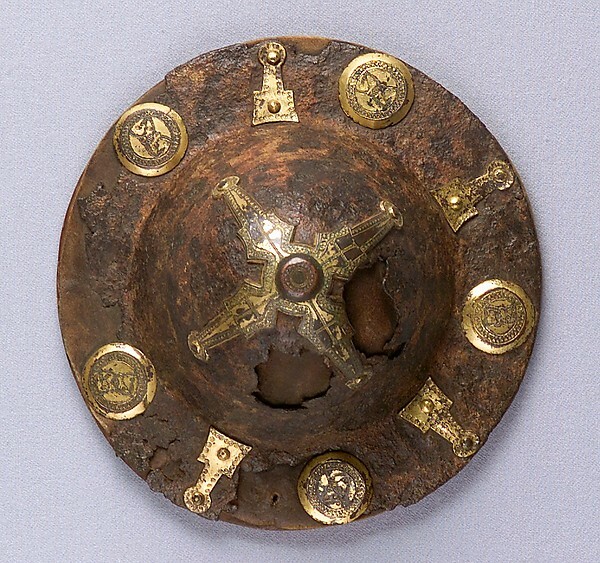 Popular in the 14th and 15th centuries, pavises were carried on the backs of the crossbowmen, set down, then moved closer as the battle progressed. Often times, a second man, called a paviser, moved the shield, freeing the crossbowman of the burden. Thus, these shields were large enough to protect one to three men, protecting them as they took turns hiding and firing. An ingenious invention, provided that the pavises were not stuck on the baggage wagons like they were at the Battle of Crecy (1346), where, unprotected, the Genoese crossbowmen took a beating first from the opposing English army, and then from the French nobles who had recruited them.